Have you ever used these? Why not?! Your family never did? The cost factor? They sound great! They’re not just for big farmers, you can get them from nurseries and most seed catalogs! I’m going to give them a try this year. USES Use for warming your plants both for starting spring crops early, and to ripen finishing fall fruits. 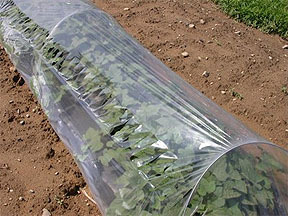 Use for frost protection, spring and fall. Keep away harmful insects that eat or lay eggs, spread viruses. Keep out birds and bunnies. A caution: ‘Colorado State University entomologists have found that overwintering insects can be trapped under the covers next to their favorite plants and be ready for action in spring. Some of these insects are tomato hornworm, onion and other root maggots, flea beetles and the [Colorado] potato beetle. Cultivate the soil before planting to reduce the number of surviving insects. Better yet, rotate crops so the survivors do not find their favorite plants nearby.’ OK? They come in lots of varieties – ask questions, shop around. Select for your needs. Get a rig that’s easy to lift for tending, and harvesting, especially if you use them to protect your strawberries from birds. The surest way to protect plants from hungry grasshoppers is to cover them with a barrier, such as a floating row cover or lightweight cloth. Be sure to hold the covers above plants with hoops or stakes, because grasshoppers are more likely to eat their way inside if leaves are pushing against the fabric. Beets & Chard Leafminers are the most common pest. 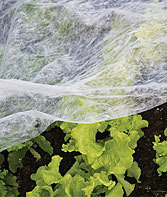 Cover plants with fine netting or cheesecloth or floating row cover to protect them from adult flies. Effective in controlling cucumber beetles, squash borer and squash bugs. Flea beetles on arugula, cucumber, eggplant, radish. Double up under the covers! Plant your main crop you want to protect, interplant with a smaller understory plant on the sunny side! You might put in some eggplant with arugula and radish interplanted on their sunny side. Remove and store when no longer needed! The insect’s cycle is over. Know your insect. To allow pollination. Especially melons, cucumbers and squash, that depend on insects for pollination. Protect Your Veggies from Freezing! Cover and tuck ‘em in! Cold season things to know about your veggies! Fertilize. Healthy plants can withstand more cold. But. From August on, if you anticipate a cold winter, avoid applying fertilizer with Nitrogen, apply at half your summer rate, until after the last frost, to prevent a flush of tender growth that can be damaged by the cold. Cool season crops, such as broccoli, cabbage, peas, and onions, originated in northern areas, and can tolerate frost and light freezes of short durations with little damage, plant cold hardy varieties. But other tender morsels often die literal black deaths from killing freezes. Lettuces, marigolds, your fragrant basil, and peppers are usually the first to go. Better taste! Cool-season vegetables, such as carrots, broccoli, cauliflower, and Brussels sprouts, produce their best flavor when they mature during cool weather. They react to cold conditions and frost by producing sugars, making them taste sweet, especially Brussels sprouts and kale, but also parsnips and leeks! Ask the folks at the farmer’s market stands if their farms have gotten a frost yet – farms in the country often get frost long before the cities. When there are several days at low temps, cole crops (cabbage, broccoli, and cauliflower) and onion sets, produce a seed stalk, called bolting. Unless you want to save seeds, at that point, harvest good leaves for greens, give the remaining plant to your compost. Early spring planting! I’ve often said, ‘Who can resist early planting? !’ Cold spells do come after last average freeze dates. Most of our plants will be fine, but some plants are really sensitive. Bell peppers don’t like cold. If you have them as transplants, keep them inside for the duration. Many seeds may not germinate during this period. Water them sparingly so they don’t rot. Early planted Beans, Cucumbers and Zucchinis may not make it. Early variety tomatoes should be fine. If your lettuce gets frosty, not to worry. They amazingly usually make it ok. Good luck to you and your planties! Frost we understand, but what’s a Hard Freeze?! When temperatures drop below 32° Fahrenheit (0° Centigrade) and remain there for several hours, even only 2 hours will do it, typically killing seasonal vegetation. Several hours at 25 to 28 degrees, ice crystals form not only on your plant, but in your plant, damaging the cell walls. The coldest time of day is just before daybreak. Clouds at night can absorb and reflect heat back to the earth. Wind can mix the ascending warm air with the descending cold air. Calm, clear nights pose the greatest danger of frost. WIND: If it is windy, less worry. Cold air must settle to form frost and any wind will usually prevent this. Or, a wind may dry your plants, making them more susceptible to freezing! 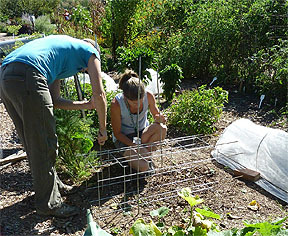 Floating Row Cover, Winter Frost Blanket, over Tomato Cages – see how they are staked in place by the cages? One gardener calls these Plant Pajamas! Watch your weather forecast religiously! Weather has no mercy. Water early in the day. Wet soil insulates and protects roots. The water warms up during the day and releases heat slowly during the night. The upper part of a plant may die, but the roots may be strong enough to push up new growth! Move frost tender plants under eaves, a spreading tree, into greenhouses, garage. Key word here is UNDER. Haunt yard sales, the thrift shop, for old bed sheets, blankets, tablecloths, curtains, towels, shower curtains, burlap sacks, tarps – many end their lives covering garden plants for frost protection! Use newspaper with clothes pins so it won’t blow around. Plastic can be worse than nothing if it touches the plant. Prop up an unused trellis, get creative! 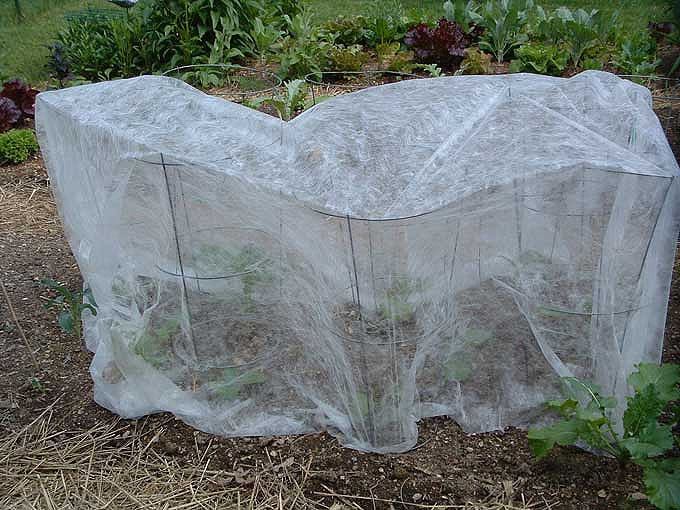 Use those wire tomato cages to support your covers! Lay them down among short plants, stand them around taller plants. At home you can lay out a folding chaise lounge chair, or lawn chairs, and cover them!! Secure the edges with stakes, rocks, bricks, or cover with soil. You can use upside down plant pots only if they are large enough that the plants they will cover don’t touch the pot. Put a rock on top to keep them from blowing over! That’s called a hot-cap! The beauty of floating row covers (see image), also called frost or winter blankets, is they can be left in place during the day! Cover the plants mid- to late-afternoon if possible, before temperatures start to drop. What you can’t cover, that is not frost hardy, harvest. Root crops such as carrots and radishes should be harvested or mulched heavily before a hard freeze. If you didn’t cover, wash your plants off before the sun gets on them. Sometimes that will counteract the freeze burn. If you did cover, take the covers off, before the sun hits the beds, so everybody can get their sun quotient for the day! Winter days are short! Dry out your covers, keep them handy. Damaged leaves appear dark green and water soaked at first, later becoming black. If your plant is totally gone, it’s compost, replace your plant. Except potatoes! They will resprout, give ‘em 10 to 14 days! Should you trim the ugly damaged stuff off and give your plant a lot of fertilizer to help it? Whoa, Nelly! That’s a NO! The damaged part is protecting the now undamaged part. If you trim and add a lot of fertilizer, tender new growth will form, and that will be toast if there is another frost or freeze. Wait to trim until no more frost is predicted, feed lightly. Was that groaning, whining I heard? Stop it. Just go out there and cover your plants, no fooling around, you hear?! You will be glad you did, it’s your plants’ lives you are saving! Besides, reviving is harder than covering, and regrowing takes all that time all over again. Also, many will be well past the window for replanting, so cover, cover, cover! Better to have a yard full of ghosts (sheet covers) and look silly, than lose your plants. Repeat, Religion! Watch WEATHER reports in case of freezes, heavy winds, rain. Santa Barbara’s average First Frost (fall) date AT THE AIRPORT is December 19, Last Frost (spring) date is (was?) January 22. That can vary from the coastal areas to the foothills, and our climate is changing generally to warmer, so these dates may not be viable guides much longer, if even now…. Interplanting, Cut & Come Again, Winter Watering! Plant peas at the base of your declining beans. Keep harvesting beans while your baby peas are coming. When you decide to remove your beans, clip the plant off at the ground, leaving the roots with their nitrogen nodules in the ground. Onions stunt peas, but carrots enhance peas! While you are at it, include space to put a row of lettuces at the sunny side of the base of your peas. The carrot or lettuce foliage will help keep your peas’ feet moist and they like that. You can harvest both standing in the same spot! Peas are the only really keep-planting-more winter crop, and the only really vertical (cages and trellises) winter crop! Gophers love peas, and carrots, and lettuce, sigh, so I would definitely install protective wire baskets for their root areas before you put up your trellises or cages. It is such a bummer to lose a producing pea plant. 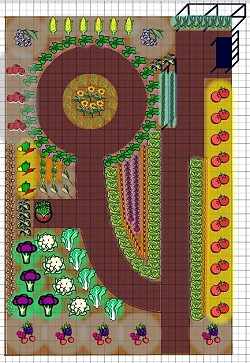 Your fall garden is going to look sparse when you start because plants like broccoli, kale, collards, cauliflower and cabbages have a big footprint, 1 ½’ centers. 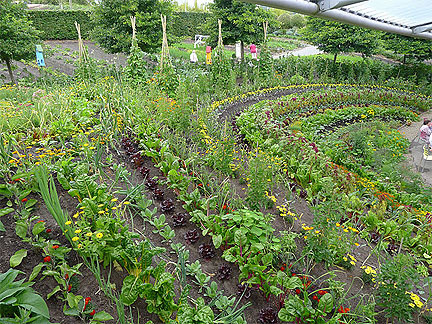 Interplanting slow growers with fast growers between and among is good space usage, reduces weeds, and is downright pretty besides being edible! The fast growers mature before the larger plants shade them out. Carrots, though having slow growing roots, grow pretty tops quickly, and they won’t mind being among your Brassicas. Because your big guys will get big, you may need to leave a dedicated sunny space for your littles – lettuces, radishes, bunch onions, beets, carrots, colorful chards. But once your Brassicas get bigger, except your cabbages, which will grow low to the ground, cut off the lower leaves on the south, sunny side. Now you can grow shorter plants under your Brassicas again. If you have strawberries that produce most of the year, they are going to need a dedicated sunny space. Make the space easy to reach for harvesting or plunk a large stepping stone in the center, then start planting around it like a wheel. Don’t plant too close to the stone, so when you use it you aren’t stepping on your plants’ leaves and fruit. Don’t plant so far from the stone that you can’t reach to harvest your fruit. 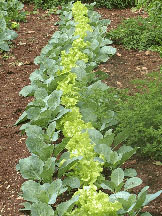 Larger, Slow Growing Vegetables: Bulb onions, cabbage, broccoli, Brussels sprouts, peas, parsnip. 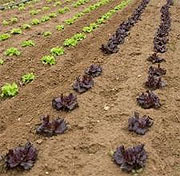 Smaller, Fast Maturing Vegetables: Beets, bunch onions, carrots, kale, lettuce, mesclun, radish, spinach, Swiss chard. 2) Cut & Come Again! Since so many winter plants are cut and come again, there is not as much concern to plant successively, a new round every few weeks or month. Cabbages planted on the same day just don’t all mature at the same time. Nature, you know. 3) Water less often, deeply, at ground level, not on the leaves. That reduces soil funguses and foliage mildews, especially on peas. Harvest dry, water afterwards. Wash your hands after handling mildewed or diseased plants before working with other plants.